‘Tis definitely the season to be jolly. But is it also the season to be healthy? It wouldn’t seem so, and yet there’s one way in which the holidays are uniquely good for you: giving is not only an essential part of the fun, it turns out giving is great for your health, too! Whatever form it takes—gift giving, volunteering your time, or donating to organizations you support—the act of giving knits people together and infuses life with meaning, purpose, happiness, and even health. Clinically speaking, giving has been found to decrease stress, lower blood pressure, increase self-esteem, improve mood and happiness, promote gratitude, foster social connections, and even extend the length of your life. All things considered, you could say that whether you’re the one who gives the gift or the one who takes it home, in this equation, everyone is on the receiving end. And if giving is indeed as contagious as science tells us, there’s no reason we can’t all have a happy holiday. So do something really selfish this season and be generous with others. Doctor’s orders! You just might find it’s the best gift you could give yourself. Can’t decide? 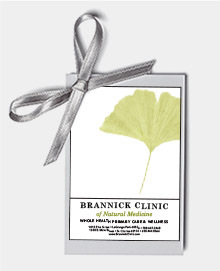 Brannick Clinic Gift Certificates also come gift-wrapped and are redeemable for massages, other services, health kits, or a monthly supply of the highest quality supplements shipped to your recipient’s doorstep. Drop in to pick a gift in person and take it with you. Or email us or give us a call and we’ll ship it out the same day!